Tim Bell has been widely – and rightly, in my opinion – excoriated for his ‘car crash’ Newsnight appearance before Kirsty Wark defending his role in Bell Pottinger’s demise. With his (former) company on the verge of bankruptcy, his own name being dragged through the mud, and mindful of the potential impact of his own consultancy Les Frontieres, Bell set out to distance himself from events, and from his sparring partner James Henderson. Arguably, he just about managed it, even if he also came across as arrogant, dismissive, and shifty. He also made a notable gaff by leaving his phone switched on. But was this the silly, cringe-worthy error it appeared? Bell is a seasoned PR hand who prepped Margaret Thatcher, amongst others, for media interviews. There is almost zero chance he would accidentally have left his phone on. And even less chance that he would have failed to turn it off again during a high-profile, high stakes interview. Bell deliberately left his phone on and enlisted friends to call and message him in order to disorientate and distract his interviewer from the outset. The diversionary tactic failed. Wark stuck doggedly to her task and proved she was not for turning – leaving Bell in an even deeper hole. Thatcher can only be turning in her grave. Concerns about privacy and piracy aside, search engines appear able to do little wrong. Google is regularly rated one of the most trusted companies in the world. A 2013 study by media agency OMD discovered Britons trust Google as much as they do the church. Baidu is one of the five most trusted brands in China. Data from PR firm Edelman’s latest Trust Barometer suggests search engines are regarded as more trustworthy sources of general news and information than all other forms of media, including the traditional/mainstream media and online word of mouth/social media. It is an interesting finding that raises all manner of questions for traditional news publishers, social media platform operators, marketers, public relations professionals and others. But the research also begs the question: should search engines really be classified as a media ‘source’? We expect search engines to deliver a good range of links to relevant, timely news coverage either when a story is breaking or when we want to get a sense of what others beyond my staple news provider(s) are saying. They are also useful for conducting research on a company, industry or topic. While we may trust Google to dredge up a decent sample of the latest news coverage research studies consistently show we continue to trust news and information from the mainstream media, companies and brands, and through friends sharing experiences and making recommendations above other sources. The fact that an article or video analysis is produced by a recognised journalist at the AP or BBC or by a blogger or colleague who we figure knows what he is talking about continues to determine whether we take it seriously, irrespective of whether the content is viewed on the publisher’s website, mobile app, Facebook or Google. Edelman’s annual trust updates provide fascinating insights into the nature and dynamics of trust across the world, but in the area of media sources it seems to be comparing apples with pears. Or am I being pedantic? There is much talk in social media and marketing circles about ‘digital’ or ‘social media’ crises. There are no such things. A crisis is a crisis, a one-off incident or series of events that seriously impacts the reputation and/or performance of an organisation – think BP’s Gulf of Mexico oil spill, the BBC’s Newsnight meltdown or Yum Brands’ recent KFC woes in China. While the internet and social media can escalate and amplify both ‘digital’ and ‘traditional’ issues, the great majority of significant reputation problems directly attributable to social media are small. According to a recent study by law firm Freshfields Bruckhaus Deringer, operational crises such as significant product recalls or environmental lapses have the greatest long-term impact on a firm’s share price (and reputation), while behavioural crises such as rogue employees or corruption have the severest short-term impact. This feels accurate, and it is useful to see it quantified. Behavioural: allegations of illegal or questionable conduct by the company or specific employees, including claims of bribery and corruption; senior employee misconduct or human rights violations. Operational: where the company’s ability to function is seriously impaired, such as significant product recalls or environmental incidents. Corporate: a crisis affecting corporate or financial well-being, including liquidity issues or material litigation. Informational: where a company’s IT infrastructure or electronic data systems are seriously impacted, including system failures; hacking and loss of customer data. Most incidents emanating from or being played out in social media fit into one or more of the categories above. 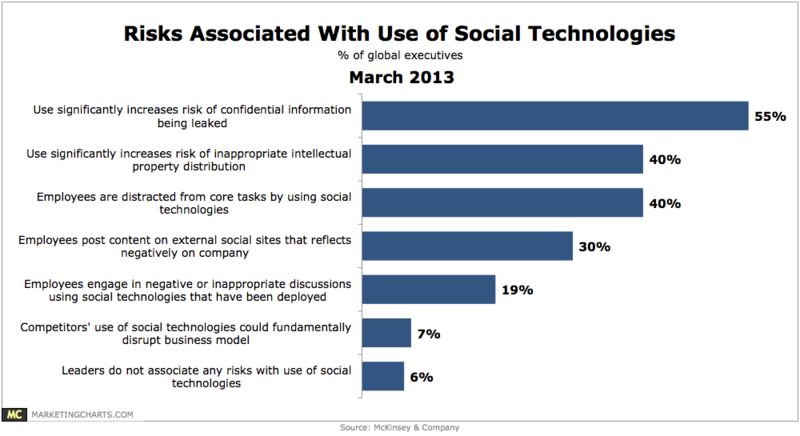 Research (see below) indicates that the majority of social media risks are informational in nature. Marketing – inappropriate, misleading or offensive marketing and advertising eg. Employees – disgruntled or poorly trained employees eg. Domino’s Pizza mucus video. Of these, only inappropriate use of social media by employees, failed standalone social media campaigns and poor online customer service can surely be construed as ‘digital’ and result largely from inadequate professionalism and a lack of coordination between marketing, sales, PR and customer service. Smart organisations have learnt to educate their people about their online behaviour and to integrate their social media campaigns and online customer service. Regrettably, bona fide crises will continue. But the death of the ‘social media’ crisis is surely nigh.